Weight Pulling Nylon Dog Harness. Simple Design Adjustable Leather Dog Harness. Multipurpose Comfy Design Leather Dog Harness. 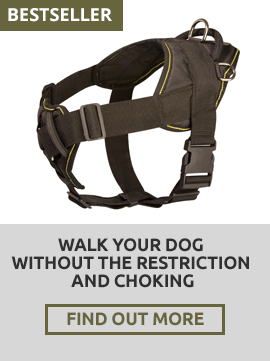 This kind of harness fits for the dogs whose job is to provide physical or mobility assistance. Usually, it is reinforced for additional durability and provides as maximum comfort as possible. 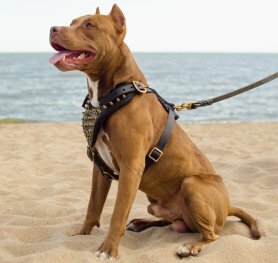 The durability and shape of such a harness depend on its usage: whether the dog is the leading one or a brace for the assisted person or if he pulls a wheelchair. A pulling wheelchair harness may have the design similar to sled dog harness model. You can check this Lightweight Nylon Assistance Dog Harness for Guide Dogs. Tracking Leather Dog Harness without Chest Plate. It is made of cold resistant fabrics and keeps your dog’s body warm during cold winter walks. There is a handle on the top, so you can assist your canine when snow is too deep in certain places. Also you can attach a leash to this harness, as it has a D-ring, that’s why there is no need to put a regular collar on your pet’s neck. You can buy for your doggy this Winter Warming Nylon Dog Coat. Specially designed to be as comfortable as possible, this harness is a link between a guided person and a guide dog. It has a handle for better control. Here you will find an almost standard version of this harness - Guide and Assistance Durable Leather Dog Harness with Long Handle. There is also a similar dog harness called "Assistance Dog Harness". It is mostly used to help older dogs to climb a hill, get into the vehicle or climb porch or stairs. 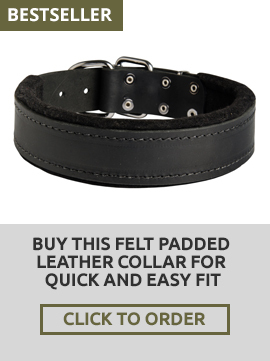 A must-have item for service dogs. Military, police, security, search & rescue, patrol and many other working dogs should wear an ID dog harness as part of working environment regulation. We offer ID dog harness with removable Velcro patches which indicate the type of work your canine is involved in. If you need such a harness, check this Nylon Dog Harness with Identification Patches. It will be perfect for identification of a working dog. Such design harnesses are used to help injured dogs to go through therapy period and get well. 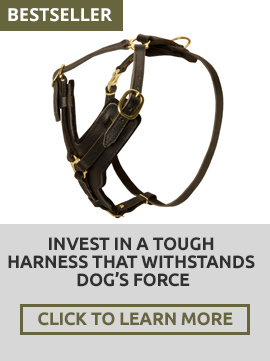 Some of those harnesses remove tension and pressure from the problematic areas, some - can be connected to the special wheelchair, which helps to allow a dog to move in a case when his hind legs are injured. You can use a handle located on the top to lift your dog when it is necessary. Here is a link to the High Quality Adjustable Nylon Dog Harness for Rehabilitation and Winter Warming. Unique Design Leather Dog Harness with Flames. Size. It is very important to measure your dog properly before purchasing a dog harness. We will help you to do it fast and easily based on our instructions and Sizing Charts and Diagrams. Be attentive measuring your canine for a harness as it will help you to avoid the hassle of exchange. All our harnesses are adjustable to certain degree, and if you are not sure which size to purchase and if your dog is not fully grown or falls in between the sizes, please do not hesitate to contact us for immediate professional assistance. You are welcome to check this Leather Dog Harness for Training and Walking. Material. For wet weather and high humidity climate, please choose a nylon dog harness, for dry weather both nylon and leather will do. It is important to mention that constant occasional usage of leather conditioner will allow you to use a leather harness in wet weather as well. Please treat your product well to prolong its service time. Here you can choose any item from a wide range of Super Durable Leather Dog Harnesses. Click here - and you can check different design Water Resistant Nylon Dog Harnesses. Reflective trim. It can save your pet’s life. This reflective trim makes your pet visible for drivers and other passers-by in the evening. It is also a great feature for you if you love night walks with your furry friend. Walk your dog safely and be a responsible owner. You can order here this Nylon Dog Harness with Reflective Trim.